40 | TH E M R EP O RT O R I G I NAT I O N S E R V I C I N G A NA LY T I C S S E C O N DA R Y M A R K E T ORIGINATION THE LATEST 3MReport.indd House Passes SAFE Licensing Act Loan officers will now have easier transitions from federally-insured institutions to non- bank lenders. I n June, the U.S. House of Representatives unani- mously passed the SAFE Transitional Licensing Act, a bill that could alter the way mortgage loan officers at federally-insured institutions move to nonbank lenders. The bill, H.R. 2121 SAFE Transitional License Act of 2015, would provide transitional licens- ing authority to originate mortgag- es for individuals who move from a federally-insured institution to a nonbank lender or from one state to another while they work to complete the SAFE Act's licensing and testing requirements. The bill was introduced by Rep. Steve Stivers (R-Ohio) in April 2015 and was approved by the House Financial Services Committee at the first legislative markup this year in March. Under the new law, bank lend - ing officers would be allowed to work at an independent mortgage bank or brokerage firm for 120 days while they complete the testing and background checks required to obtain a state license, according to Stivers. As of now, mortgage lenders must be regis- tered in the National Mortgage Licensing System and Registry but they do not have to obtain a state license. Stivers stated in April, "The SAFE Act inhibits job mobility and puts independent mortgage lenders at a considerable disad- vantage in recruiting talented individuals." In 2008, Congress passed the Secure and Fair Enforcement (SAFE) for Mortgage Licensing Act. Its purpose was to ensure all lending officers could be tracked and held accountable, but pressure from the banking industry prompted lawmakers to exempt lending officers from SAFE Act requirements. Stivers noted that when a loan officer transitions from a federally-insured institution to a nonbank lender, they are stagnant for weeks or even months while they meet the SAFE Act's licens - ing and testing requirement. 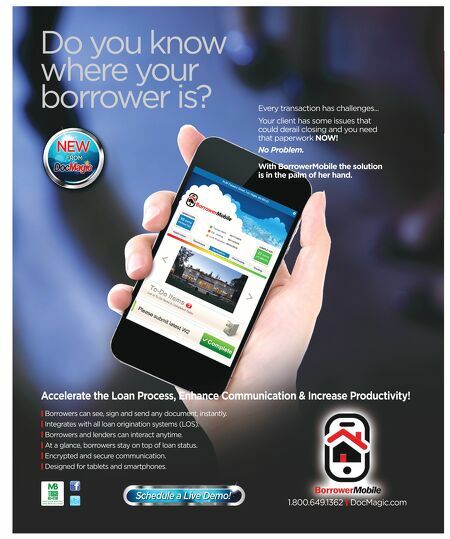 "This is despite the fact that they have already been employed and registered as a loan officer," Stivers said. "This is simply unfair." According to Marc Savitt, President of the National Association of Independent Housing Professionals (NAIHP), Stivers' bill will make it easier for lending officers to return to the brokerage business and that the organization welcomes them back to the brokerage side. One group that opposes the SAFE Act changes is the National Association of Mortgage Professionals (NAMB). This group believes state law and regulations are already in place for consumer protection and should not be bypassed by those not properly educated and tested. "HR 2121 and any Senate companion bill will dilute the rights of all states to protect consumers," NAMB stated in a press release. Valerie Saunders, NAMB Government Affairs Committee Chair, expounded on that state - ment. "One of the touchstones of the Dodd-Frank Act was to permit states to go beyond federal law to protect consumers in their state," Saunders said. "HR 2121 com - pletely nullifies state consumer protections." 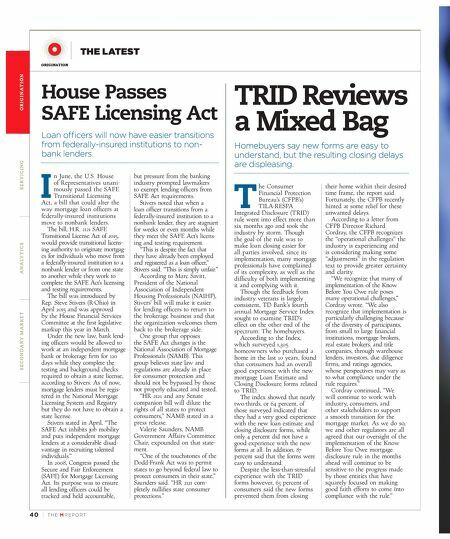 TRID Reviews a Mixed Bag Homebuyers say new forms are easy to understand, but the resulting closing delays are displeasing. T he Consumer Financial Protection Bureau's (CFPB's) TILA-RESPA Integrated Disclosure (TRID) rule went into effect more than six months ago and took the industry by storm. Though the goal of the rule was to make loan closing easier for all parties involved, since its implementation, many mortgage professionals have complained of its complexity, as well as the difficulty of both implementing it and complying with it. Though the feedback from industry veterans is largely consistent, TD Bank's fourth annual Mortgage Service Index sought to examine TRID's effect on the other end of the spectrum: The homebuyers. According to the Index, which surveyed 1,305 homeowners who purchased a home in the last 10 years, found that consumers had an overall good experience with the new mortgage Loan Estimate and Closing Disclosure forms related to TRID. The index showed that nearly two-thirds, or 64 percent, of those surveyed indicated that they had a very good experience with the new loan estimate and closing disclosure forms, while only 4 percent did not have a good experience with the new forms at all. In addition, 87 percent said that the forms were easy to understand. Despite the less-than-stressful experience with the TRID forms however, 63 percent of consumers said the new forms prevented them from closing their home within their desired time frame, the report said. Fortunately, the CFPB recently hinted at some relief for these unwanted delays. According to a letter from CFPB Director Richard Cordray, the CFPB recognizes the "operational challenges" the industry is experiencing and is considering making some "adjustments" in the regulation text to provide greater certainty and clarity. "We recognize that many of implementation of the Know Before You Owe rule poses many operational challenges," Cordray wrote. "We also recognize that implementation is particularly challenging because of the diversity of participants, from small to large financial institutions, mortgage brokers, real estate brokers, and title companies, through warehouse lenders, investors, due diligence firms, and ratings agencies, whose perspectives may vary as to what compliance under the rule requires." Cordray continued, "We will continue to work with industry, consumers, and other stakeholders to support a smooth transition for the mortgage market. As we do so, we and other regulators are all agreed that our oversight of the implementation of the Know Before You Owe mortgage disclosure rule in the months ahead will continue to be sensitive to the progress made by those entities that have squarely focused on making good faith efforts to come into compliance with the rule."